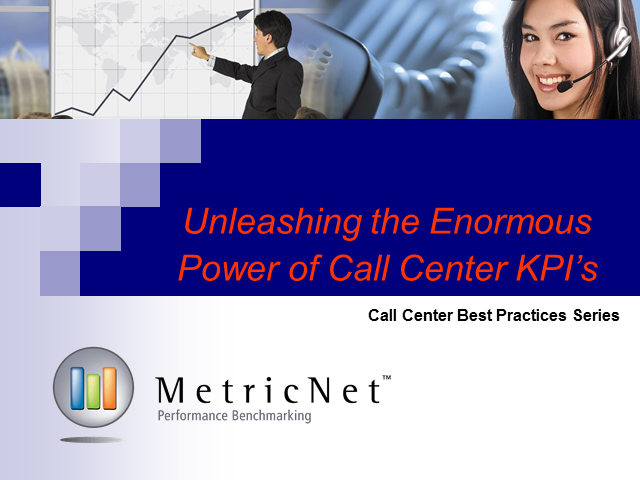 In Unleashing the Enormous Power of Call Center KPIs, MetricNet provides an overview of the Best Practices in Call Center Performance Measurement. Our best practices help call centers lower costs and increase customer satisfaction! How the industry's top performing Call Centers track and trend their performance. How to use Call Center KPIs diagnostically to achieve World-Class Performance. How to apply Best Practices in Call Center Performance Measurement and Management. The key success factors in performance measurement from the industry's top performing Call Centers. Many Call Center professionals are unfamiliar with the key performance indicators (KPIs) that are important to track and trend and even fewer are aware of what constitutes acceptable performance. In this session, Jeff Rumburg will share the results of MetricNet’s 2019 Global Benchmarking Initiative for Call Centers, discuss the methodology, define the KPIs used for benchmarking, and share performance data from more than 140 companies worldwide. Many Service and Support professionals are unfamiliar with the key performance indicators (KPIs) that are important to track and trend and even fewer are aware of what constitutes acceptable performance. In this session, Jeff Rumburg will share the results of MetricNet’s 2019 Global Benchmarking Initiative for Service and Support, discuss the methodology, define the KPIs used for benchmarking, and share performance data from more than 140 companies worldwide. Desktop support has evolved dramatically in recent years. From virtualization and remote desktop control, to the rise of SWAT teams and staff augmentation, most desktop support organizations bear no resemblance to their predecessors. In this webcast, you’ll receive industry data that illustrates key trends in desktop support. Jeff Rumburg will reveal the underlying drivers of these trends and their implications for the future of desktop support, including what today’s KPIs tell us about the future, the impact on people, process, and technology, and how to position desktop support for future success. An overview of Call Center Best Practices. HEAR how the industry's top performing Call Centers Achieve World-Class Status! LEARN key strategies for Enhancing your Call Center Performance! APPLY Best Practices from your peers in the industry! In this webcast, MetricNet will share the Key Success Factors from the industry's top performing Call Centers! An overview of best practices in Service and Support Performance Measurement. HEAR how the industry's top performing Service and Support organizations track and trend their performance! LEARN how to use KPIs diagnostically to achieve World-Class Performance! APPLY Best Practices in Service and Support Performance Measurement and Management! In this webcast, MetricNet will share the key success factors in performance measurement from the industry's top performing Service and Support organizations! IT Service and Support organisations worldwide are moving aggressively towards new business models. ITIL 4, AI, and hiring practices that place a premium on business skills are radically altering the landscape of the industry. A bright future awaits those who are prescient enough to embrace these industry megatrends, while those who are slow to adapt will operate at a significant disadvantage for many years to come. In this webcast, Jeff Rumburg, Managing Partner at MetricNet, will use industry benchmarking data to connect the dots and present a vision of the service organization of the future. Attendees will learn how people, process and technology are converging upon a tipping point that will radically reshape the support industry of the future. As the gateway to IT for most end users, service and support is the biggest driver of customer satisfaction and can generate a tremendous return on investment. IT leaders and managers who ignore these facts do so at their own peril, for the simple truth is this: the success and longevity of an IT management team are directly tied to the success of service and support. In this session, Jeff Rumburg will use benchmarking data and case studies to demonstrate the untapped value of all service and support organizations. HEAR how the industry's top performing Service Desks achieve world-class status. LEARN key strategies for enhancing your Service Desk performance. APPLY Best Practices from your peers in the industry. Benchmarking is a proven tool for optimizing contact center performance. Effective benchmarking enables a contact center to quantify its performance, compare against others in the industry, identify performance gaps, and define the actions necessary to optimize performance. Industry data shows that contact centers that conduct annual benchmarking are far more likely to achieve world-class performance, yet fewer than 20% of all contact centers engage in benchmarking. In this webcast, Jeff Rumburg will demonstrate through case studies how benchmarking enables contact centers to optimize their performance. He will share the results of MetricNet’s 2018 Global Benchmarking Initiative, discuss the Benchmarking Methodology, define the KPIs used for benchmarking, and provide performance data from more than 300 contact centers worldwide. Industry data shows that support organizations that conduct annual benchmarking are far more likely to achieve world-class performance. Yet fewer than 20% of all support groups engage in benchmarking. In this session, you’ll review performance data from more than 200 support organizations, as well as several case studies that show how your peers have harnessed benchmarking to quantify performance, draw industry comparisons, identify performance gaps, and define the actions necessary to optimize efficiencies. An overview of Call Center Best Practices. HEAR how the industry's top performing Call Centers Achieve World-Class Status! LEARN key strategies for Enhancing your Call Center Performance! APPLY Best Practices from your peers in the industry! In this webcast, MetricNet will share the Key Success Factors from the industry's top performing Call Centers! Contact centers that understand and quantify their ROI gain several important advantages; chief among them is the ability to obtain funding and other resources based upon the economic benefits provided by the contact center. This webcast will define ROI as it applies to different types of contact centers, including service, sales, and collections. Additionally, it will lay out a simple methodology for computing ROI for the contact center, and share ROI data that has been computed from more than 200 contact centers worldwide. ITIL, and more broadly, IT Service Management, is now a 31-year-old discipline. It was originally established in the UK under the government of Margaret Thatcher in 1985. For those working in IT Service and Support, the implications of this are profound. First, it means that IT support professionals have an enormous body of knowledge to draw upon for industry best practices. Secondly, it almost always means that other corporate services, such as HR, facilities, safety, etc., are far less mature than IT Service and Support. Savvy IT managers recognize this opportunity, and are increasingly taking up the challenge of providing enterprise leadership in corporate services. I want to challenge leaders from both IT and non-IT services to give serious thought to the role of enterprise services in your organization. This is the kind of opportunity that doesn’t come along very often. It has the potential to transform the delivery of all services in the enterprise, while saving money and improving the quality of service that your customers receive. Moreover, it can be a game changer for your career. Enterprises worldwide are in desperate need of leadership on this issue. So if you have been looking for that next big career opportunity, it may be right in front of you! An overview of best practices in Service Desk Performance Measurement. HEAR how the industry's top performing Service Desks track and trend their performance! LEARN how to use KPIs diagnostically to achieve World-Class Performance! APPLY Best Practices in Service Desk Performance Measurement and Management! In this webcast, MetricNet will share the key success factors in performance measurement from the industry's top performing Service Desks! The growth of multichannel support and BYOD policies has opened up a plethora of new avenues for customers to engage with IT support. This has the potential to create a richer, more satisfying experience for the customer, but savvy support organizations recognize that it isn’t good enough to simply replicate the same service in different channels. It’s really about maximizing the customer experience for each unique channel and device. In this session, you’ll find out how progressive support organizations have harnessed the potential of “any time, any place” support to drive and sustain high levels of customer engagement. You’ll review case studies and benchmarking data that illustrate the power of multichannel, multidevice support in today’s complex IT enterprise. Mr. Rumburg is the winner of the Ron Muns Lifetime Achievement Award, was named one of HDI’s Top 25 Thought Leaders in Technical Support and Service Management for 2016, 2017 and 2018, and has served on HDI’s strategic advisory board. He is co-founder and Managing Partner of MetricNet, LLC, where he is responsible for global strategy, product development, and client engagement delivery. As a leading expert in benchmarking and re-engineering, Mr. Rumburg authored a best selling book on benchmarking, and has been retained as a benchmarking expert by such iconic companies as American Express, Intel, Coca Cola, and Emory Healthcare. MetricNet is the global leader in IT Service and Support and Contact Center benchmarking. More than half of the FORTUNE 500 rely on MetricNet benchmarks to improve and optimize their performance. MetricNet is the first, and still the only company to offer downloadable service desk and desktop support benchmarks from their website. With a global benchmarking database of nearly 4,000 IT Service and Support benchmarks, MetricNet has the most comprehensive database of process and performance metrics in the industry.